"You want someone who doesn't have the guts to fight back?" "No. I want someone who has the guts not to fight back." "You give me a uniform. You give me a number on my back. I'll give you the guts." This was my absolute favorite part of the movie. We went and saw 42 on Saturday night and it's one of those movies that just inspire you. There were funny parts, there were goose-bump parts, I cried, and I cringed. It's based on a true story about Jackie Robinson, the baseball player who was the first African American to play for a MLB team. Rickey, the team executive for the Brooklyn Dodgers, is the man who decided to bring an African American into the white league. At the time, whites played in one baseball league, blacks played in a separate baseball league, and Rickey wanted to break this color barrier. 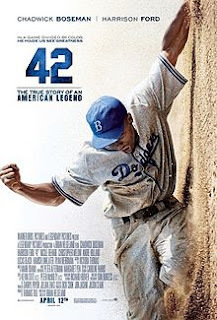 Throughout the movie, you learn 2 reasons he wanted to do this: 1 // If the major leagues are supposed to be the best players in the nation, then it should include the BEST players, no matter the color of their skin. He knew that some of the players in the black league were far better than some of the whites playing MLB. And 2 // He wanted to make up for not standing up to an unfair situation due to racial segregation when he was playing baseball. Rickey asked Robinson to join the white league and Robinson accepted. He played for the minor leagues, then eventually signed on with the Brooklyn Dodgers in the major leagues. Obviously because of segregation and racial inequality, all parties involved knew that it would not be an easy transition for anyone involved. Throughout the entire story, Rickey is there standing by Robinson, silently cheering him on, and motivating him to continue when Robinson feels like there's no way he can possibly put up with the verbal abuse. The quote above is a conversation Rickey has with Robinson when he asked Robinson to join the league. I love the quote because it's so true that it takes more 'guts' or determination to not behave like cowards who are constantly putting you down. It's much harder to 'be the better person' in a situation than it would be to fight back. Robinson never did fight back. Rickey and Robinson's wife truly were his "rock" in any tough situation and helped hold him together. I'm not going to talk about too many more details because you really should see this movie. Robinson went on to be very successful, started being accepted by his teammates and other players, and the game of baseball was forever changed. Then I saw it on facebook - about 14 times. And since then I think it's basically gone viral, but anyway. I had been planning on writing my post on 42. Then I thought about not writing it because it just didn't feel right to post 'So, I went to this movie. Loved it. Oh, and sorry about the whole Boston thing.' 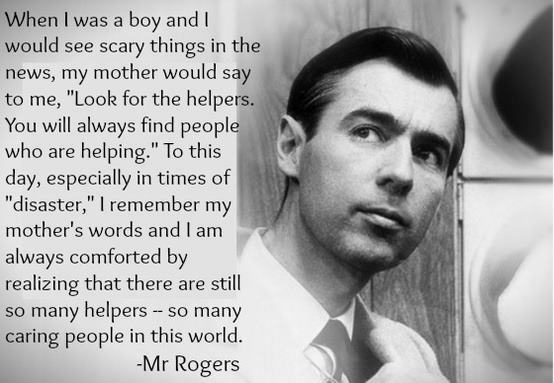 But really, Mr. Rogers quote can be relevant to many different types of "disaster". With everything going on at the Boston Marathon since Monday, it's hard to feel like we even live in a world that has good people. There are sick people out there who do horrible things and it can be so easy to focus on that. What we forget, is that there are good people. In a world full of segregation and inequality, there was one white person who worked hard to break the color barrier in the sport of baseball. In a world of bombings and shootings, there are people helping. We have to remind ourselves of this in the midst of tragedies. It's not always easy, but if we don't the bad people win. If we don't remind ourselves of the good, life will be full of disappointment and despair. If we don't focus on the good people, then what are we even living for? My prayers go out to Boston and my prayers go out to all the good people. I pray that you stay strong enough to live for the good. And you should go see 42. 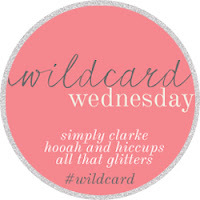 Linking up for wildcard wednesday. cute blog! newest follower. Follow back if you'd like!